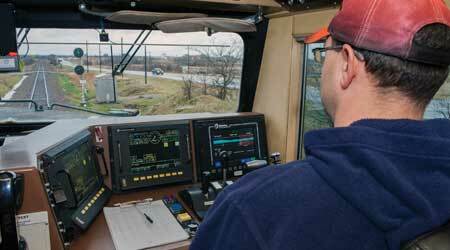 A BNSF engineer monitors consoles linked to the Class I’s I-ETMS system. Photo – BNSF Railway Co. The end of 2018 will mark a milestone in freight and commuter railroads’ ongoing efforts to implement positive train control (PTC). Come Dec. 31 — the federal due date — the 41 railroads that are mandated to adopt the technology will have spent a decade working on their PTC systems, including three years past the original end-of-2015 deadline. But that date won’t mean the end of PTC implementation, or even the near end. Only BNSF Railway Co., Metrolink, the Southeastern Pennsylvania Transportation Authority (SEPTA) and Union Pacific Railroad likely will have a federally certified PTC system in operation on all required route miles and locomotives by Dec. 31, according to the Federal Railroad Administration (FRA). Most railroads expect to seek approval for an allowable alternative schedule — which extends the deadline two years to Dec. 31, 2020 — to continue tests, obtain system certification, achieve interoperability with other railroads or fully adopt PTC on mainlines. For example, successful interoperability would mean each railroads’ devices along tracks, in locomotives and at back offices can communicate seamlessly with one another. Thirty-two of the 41 roads plan to apply for an extension, according to a PTC report issued Sept. 13 by the U.S. Government Accountability Office. To qualify for the extension, railroads must accomplish the following by 2018’s end: install all system hardware, acquire all required radio spectrum and complete employee training. In addition, Amtrak and Class Is must implement a PTC system or initiate a revenue service demonstration (RSD) on the majority of their territories or required route miles, and commuter roads and short lines either must initiate an RSD on at least one track segment or meet substitute criteria. Before a recent test run on Metra’s Rock Island District line, Engineer Jason Cook (left) initialized the PTC system while Senior PTC Test Engineer Tom Alonzo watched. A number of ongoing obstacles — interoperability chief among them — are impeding implementation, several testifiers said at a PTC hearing conducted Sept. 13 by the House Subcommittee on Railroads, Pipelines and Hazardous Materials. The challenges include the limited number of system vendors, significant hardware and software technical issues that often take considerable time to diagnose and resolve, and the very early nature of interoperability testing, FRA Administrator Ronald Batory said during his testimony. “Moving forward, the FRA will continue to support and facilitate railroads’ implementation of PTC technology by utilizing the tools afforded by Congress, and providing extensive technical assistance and guidance to railroads and suppliers,” he said. The challenges surrounding implementation are why Dec. 31 merely marks the end of “PTC 1.0,” or the initial 10-year journey toward adoption, Batory said during an early August interview. In addition to pushing the deadline another two years, railroads in some cases can legally stretch full implementation even longer — to as late as 2023 — so software issues can be resolved or interoperability with tenant railroads can be achieved, he said. As the 1.0 period drew closer to an end, many railroads continued to make strides. According to an FRA second-quarter PTC progress report issued to Congress July 1, 15 railroads had installed all system hardware and 12 others had installed 95 percent to 99 percent of hardware by June 30. Also as of that date, PTC systems were in RSD or operation on about 37,705 route miles, or 65 percent of the 58,000 route miles subject to the mandate. The report shows the number of “at-risk” railroads — those that installed less than 90 percent of hardware by June 30 and might not qualify for an extension — dropped from 12 to the following nine commuter-rail agencies: Altamont Corridor Express; Caltrain; the Capital Metropolitan Transportation Authority; Maryland Area Regional Commuter system; New Jersey Transit; New Mexico Rail Runner Express; South Florida Regional Transportation Authority; SunRail; and Trinity Railway Express. Commuter railroads — which collectively will spend about $4.1 billion on PTC — are trying hard to comply with the mandate. And they have made “substantial progress” toward implementation, American Public Transportation Association (APTA) officials said during a mid-August press conference on PTC. As of June 30, commuter roads had acquired 91 percent of spectrum; installed 85 percent of 13,698 pieces of onboard equipment on locomotives and cab cars; completed 79 percent of 14,083 wayside installations; made 78 percent of back office control systems ready for operation; and trained 74 percent of 14,847 employees. In addition, about one-third of the roads are testing their systems, performing RSDs or operating trains with PTC, APTA officials said. One of them is SEPTA, which has spent about $370 million on implementation. The agency installed PTC on all 13 of its Regional Rail lines and has been operating trains equipped with the technology since May. SEPTA worked with Ansaldo STS to implement an Enhanced Automatic Train Control (E-ATC) system with an Advanced Civil Speed Enforcement System II (ACSES II) overlay. The agency now is aiming to establish interoperability with Norfolk Southern Railway and CSX by year’s end. For Amtrak, interoperability remains a challenge as implementation continues. The railroad is installing ACSES II wayside equipment along a 60-mile line between New Haven, Connecticut, and Springfield, Massachusetts, and a 105-mile line between Poughkeepsie and Schenectady, New York. Amtrak uses Alstom’s Incremental Train Control System along the 97 miles of track it owns in Michigan and now is testing the system on the Michigan Department of Transportation-owned portion of the Michigan Line. Tests are scheduled to conclude in the fourth quarter. In addition, Amtrak is equipping all diesel locomotives that will operate outside the Northeast Corridor with Wabtec Corp.’s Interoperable Electronic Train Management System (I-ETMS®) that’s being adopted by Class Is. As of Sept. 10, the railroad had 607 of 901 route miles in PTC operation and 480 route miles in testing, said Amtrak Chief Operating Officer Scot Naparstek during the House subcommittee hearing. In addition, 88 percent of Amtrak-owned locomotives required for revenue service were equipped and PTC operable, eight of 11 track segment installations were finished, 132 of 140 radio towers were installed and equipped, and employee training was completed. On Jan. 1, Amtrak plans to operate PTC across all the tracks it controls, as well as much of the host railroad network, said Naparstek. Currently, 222 of Amtrak’s 315 daily trains operate with PTC along some or all of their routes. “We believe we will have strategies in place that will permit us to continue operations until operational PTC or PTC-equivalency is achieved for all of our network,” Naparstek said. But given the difficulty of completing testing with so many freight- and commuter-rail partners, and the potential for some limited technical issues to arise, Amtrak will need to submit an extension application to the FRA, he said. “[This will] enable us to continue operating while we finalize testing of our system and the systems of our hosts and tenants,” said Naparstek. Sometime this month, Metra also plans to file for the extension, primarily to gain additional time for interoperability. The agency can learn from Metrolink in that regard, said Bruce Marcheschi, Metra’s chief engineering officer who will become deputy executive director of operations in January 2019. The first U.S. commuter railroad to operate PTC across its entire network, Metrolink Established interoperability with BNSF, UP and Amtrak in about 18 months. NS workers installed a PTC-equipped antenna farm on a locomotive at the Norris Yard shop in Birmingham, Alabama. About a year ago, the Association of American Railroads (AAR) formed the Chicago PTC Deployment Task Force, which is aiding Metra’s efforts. Representatives from railroads in Chicago meet every two weeks to discuss best practices and ways to work together better on interoperability and other implementation issues. On Sept. 17, Metra marked the completion of onboard and wayside installations, which involved 528 vehicles and 240 wayside locations. The agency now has all of its trains in PTC revenue service on the BNSF line and expects to begin PTC revenue service on the three UP lines (North, Northwest and West) by year’s end. RSDs will begin this month on the Rock Island District line and are projected to start later in 2018 on the SouthWest Service line, followed by other lines in 2019 and 2020. The railroad is working on a total of nine segments that require PTC. As of Aug. 31, Metra had trained about 60 percent of 324 employees in the engineering, transportation and mechanical departments on the Rock Island District line. About 1,800 employees will need to be trained on PTC, said Marcheschi. 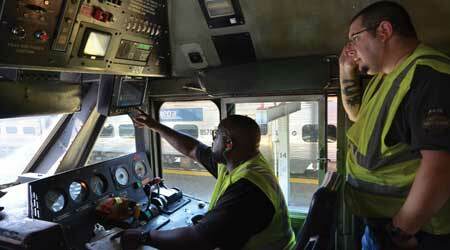 Formal training for locomotive engineers began last month. Engineers will be trained last to reduce the time between learning and employing PTC, said Marcheschi. “That way, it’s fresh on their minds,” he said. Through June, Metra had spent $216.4 million on implementation, which the agency expects to complete by 2020’s end or perhaps somewhat earlier. The agency’s total PTC cost is estimated at $400 million. The Massachusetts Bay Transportation Authority also expects to complete deployment prior to 2020’s end. The agency — which contracted Ansaldo STS to furnish a complete PTC system on its entire commuter-rail network for $338 million — pegs completion by August 2020. For the Port Authority Trans-Hudson Corp. (PATH), the PTC price tag is $759 million. The commuter-rail agency serving portions of Manhattan and northern New Jersey is pursuing two train-control systems. 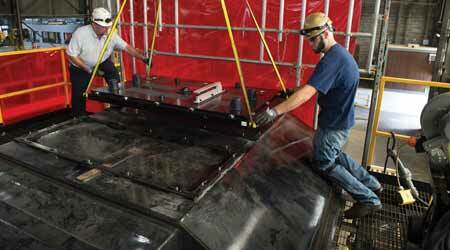 PATH workers are helping to install PTC and a communications-based train control system. PATH is installing an E-ATC system for PTC provided by Siemens, as well as a communications-based train control (CBTC) system supplied by Siemens and Ansaldo, said Michael Marino, the agency’s general manager and director of rail transit, during a late August interview. Although there’s no federal regulation for automatic train control, PATH is rolling CBTC and PTC into one to “make our system safer,” said Marino, who plans to retire in January. 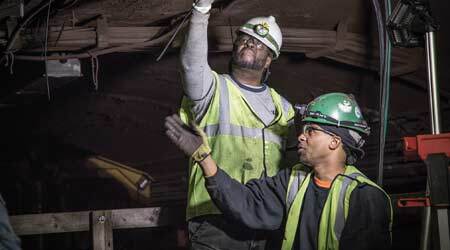 CBTC work is about 80 percent finished and slated for completion by 2021. Meanwhile, Kawasaki Rail Car Inc. has installed E-ATC components on 228 of 350 A cars that are considered PATH’s locomotives. In addition, 72 cars that are on order for delivery by 2022 include 10 A cars that will be fitted with E-ATC components. PATH now is finishing its PTC testing program with non-revenue-service trains that operate on weekends. The FRA is reviewing the agency’s system for certification and will conduct inspections in part by riding some test trains, said Marino. PATH expects to complete implementation by 2018’s end. The Class don’t, but they anticipate completing major portions of their projects by then. On Dec. 31, the large roads expect to have all hardware installed, all spectrum in place, all employees trained and 80 percent of required route miles operational with PTC, according to the AAR. The large roads already have spent about $10 billion on PTC and anticipate the total cost to exceed $11 billion. All Class Is will have PTC fully implemented no later than 2020’s end, said AAR President and Chief Executive Officer Ed Hamberger during his subcommittee hearing testimony. “In the meantime, Class Is will continue to work with each other and their tenant passenger and short-line railroad partners to successfully achieve full interoperability,” he said. Kansas City Southern filed for an extension in September to obtain additional time for interoperability. The railroad has met the extension requirements by hitting a revenue service-route miles target, acquiring all required 220 MHz radio spectrum, equipping and operating the entire locomotive fleet, installing and operating all wayside and communications equipment, and finishing employee training, KCS officials said in an email. The Class I expects to spend about $300 million on implementation. As of June 30, 98 percent of locomotives were fully equipped and PTC operational, 99 percent of employee training was completed and 64 percent of PTC route miles were in revenue service. BNSF likely would have completed implementation by year’s end if not for interoperability obstacles. As a result, the Class I filed for the deadline extension in June and received FRA approval last month, BNSF officials said in an email. The Class I leads the North American freight-rail industry with achieving interoperability, they said. So far, BNSF has become interoperable with Montana Rail Link; the Dakota, Missouri Valley and Western Railroad; Amtrak; Metra; Metrolink; Northstar; and Sound Transit. “We are actively working with each of the approximately 30 railroads with which we need to be interoperable to identify their needs and how we can be of help. This assistance ranges from technical, operation and regulatory advice to a variety of services, such as back office hosting and crew training,” BNSF officials said. During its PTC project — which is estimated to cost about $2 billion — the railroad operated more than 1.7 million revenue service trips from December 2012 to August 2018. As of June 30, BNSF had implemented the technology on all 11,500-plus route miles, installed all 6,000-plus radio towers, equipped all 5,000 locomotives and trained more than 21,000 employees. Meanwhile, UP — which expects to spend about $2.9 billion on PTC — also plans to file for the extension to continue implementing, testing and refining its I-ETMS system in 2019 and 2020. As of mid-August, the Class I had prepared 180 track segments with wayside devices, reaching 99 percent completion, and placed 11,920 route miles in PTC operation, or 70 percent completion. The railroad needs to install PTC on more than 17,000 route miles, equip 5,515 locomotives and place more than 10,000 wayside antennas, or about one-third of the industry’s requirements in those three categories, according to UP. The route miles are 45 percent more than the next largest railroad, the Class I claims. As of mid-August, UP also had trained more than 25,690 additional employees on PTC operations, or 97 percent of its required total. NS plans to file for an extension, too, to work on interoperability and improve the scalability and reliability of its I-ETMS system, which will cost about $2 billion to adopt. The Class I is working with 30 other railroads. As of June 30, NS was operating PTC trains in revenue service across 4,211 required route miles. The Class I initiated PTC operations on an additional 429 miles, exceeding the 2018 extension requirement of 4,015 miles in revenue service. In addition, 2,775 locomotives were fully equipped and PTC operable, and more than 18,469 employees and supervisors (98 percent of the total required) were trained. The railroad commissioned 181 PTC-ready locomotives, leaving only 125 to reach the readiness requirement, NS officials said on the Class I’s website. “The massive wayside interface unit, tower and radio installation effort of over 11,000 components is also almost complete,” they said. In addition, NS continues to verify and validate the I-ETMS system at its PTC lab in Atlanta. As of June 30, the railroad tested more than 14,998 scenario iterations of PTC states and functions, and more than 147 iterations of software releases. CSX continues to mark progress, as well. The Class I is on track to meet the mandate by having all hardware installed on its footprint — totaling about 13,000 route miles — by 2018’s end, CSX officials said in an email. As of mid-September, the Class I could operate PTC on about two-thirds of its network, they said. “In addition, we are working concurrently with our commuter and short-line partners to assist in their implementation efforts by providing technical guidance and other assistance, as needed,” CSX officials said. The railroad so far has spent more than $2.1 billion on implementation, with the total cost estimated to exceed $2.4 billion. Like all Class Is, CSX is exploring opportunities to leverage its PTC investment post-mandate to advance data and analytics efforts, and efficiency measures, CSX officials said. “One of the clear ways to do that is through one-person crews and, ultimately, way down the road, perhaps autonomous trains,” CSX Executive Vice President and Chief Financial Officer Frank Lonegro said Sept. 5 at Cowen and Co.’s Global Transportation Conference in Boston. What technological advancements emerge as PTC implementation is completed and beyond “will be interesting,” said the FRA’s Batory. “After the 1.0 period, we will see more sophisticated technologies,” he said. Email questions or comments to jeff.stagl@tradepress.com.